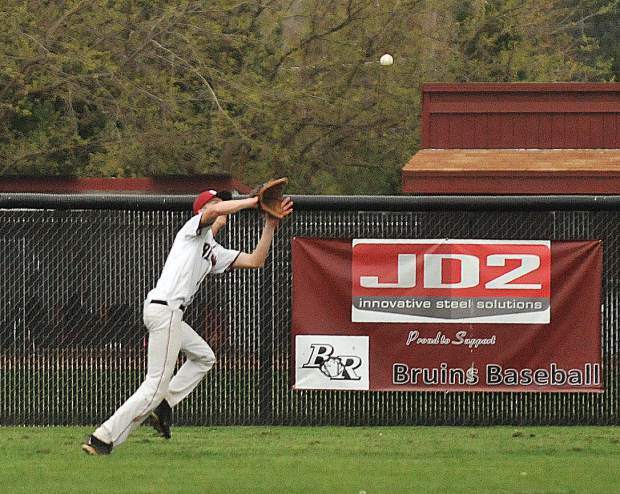 Bear River outfielder Jake Leonard makes a running catch during Tuesday's PVL matchup against the Colfax Falcons. 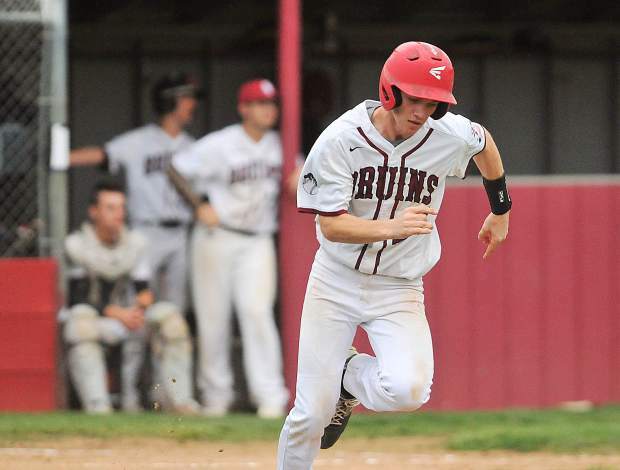 Bear River sophomore Cole Winters, runs for first base after putting a ball in play during matchup against PVL rival Colfax earlier this season. 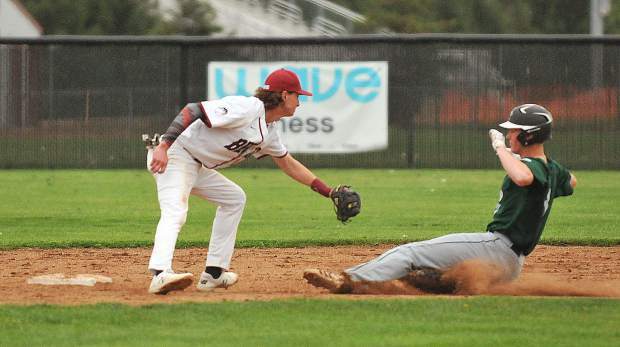 Bear River's Nathan Van Patten readies to tag out a Colfax baserunner attempting to steal second base during a game earlier this year. 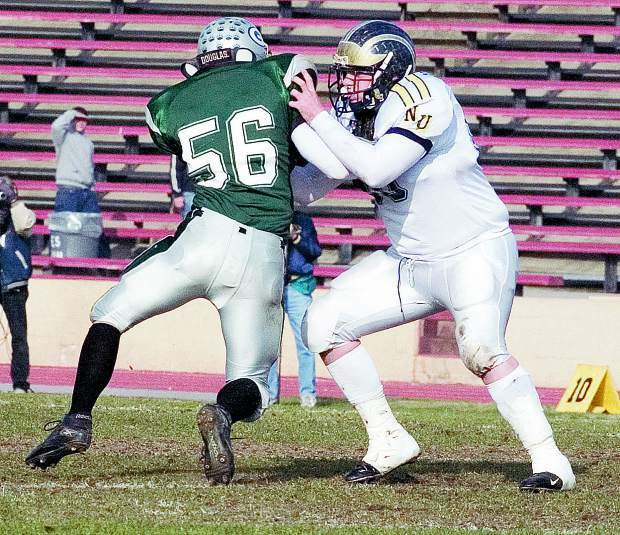 The Bruins and Falcons will face off for the fourth time this season when they battle it out in the Sac-Joaquin Section Division V playoffs today. Bear River right hand relief pitcher Aaron Sasville works to keep Colfax baserunners from scoring in the top of the 7th inning of Tuesday's PVL league matchup against the visiting Falcons. Sasville would strand runners in the top of the 7th, but the inability to score in the bottom of the inning ceded the win to Colfax 5-3. Bear River starting pitcher Clay Corippo readies to fire a pitch during Tuesday's PVL matchup against the visiting Colfax Falcons. Bear River second baseman Nathan Van Patten readies to tag out a Colfax baserunner attempting to steal second base during Tuesday's game. 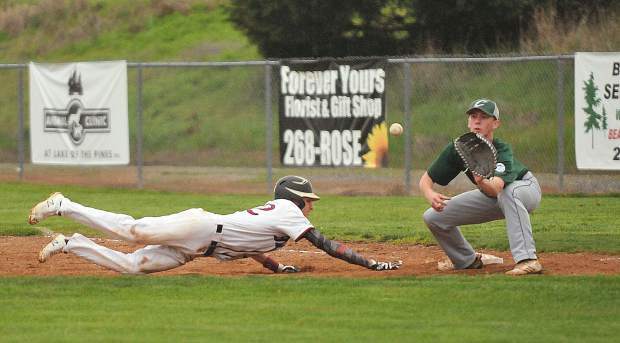 Bear River pitcher Aaron Sasville works to keep Colfax baserunners from scoring in the top of the seventh inning during a game earlier this season. 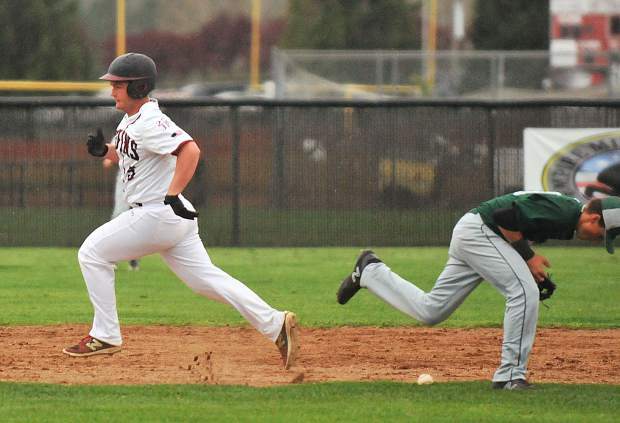 Bear River baserunner Nathan Van Patten rushes to get back to first base before the Colfax tag during Tuesdays game. Van Patten would eventually steal second base. 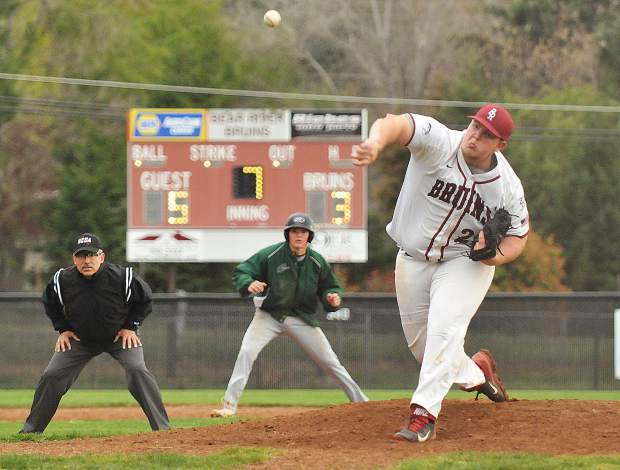 Bear River starting pitcher Clay Corippo has been a standout on teh mound all season. Corippo and teh rest of the Bruins will open postseason play at home Thursday. Bear River baserunner Anthony Crawford runs past the Colfax second baseman as he bobbles a play during Tuesday's loss to the Falcons at Bear River High School. Bear River's Clay Corippo puts the ball into play during Tuesday's PVL matchup against the Colfax Falcons. 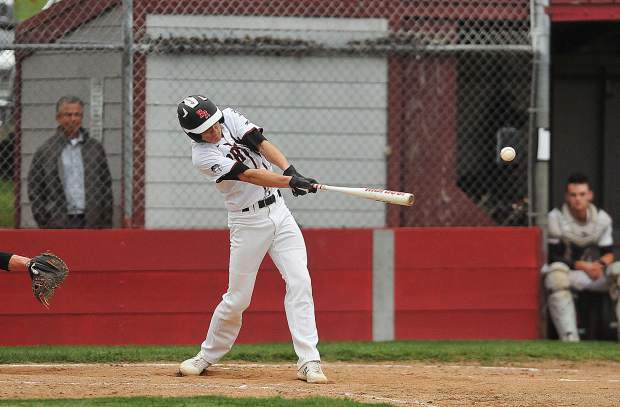 The Bear River baseball team lost another tight contest with rival Colfax, falling 5-3 at home Tuesday. The Bruins took a 1-0 lead in the second inning when Clay Corippo scored on a Jake Leonard base hit. Colfax responded quickly and took the lead with four runs in the top of the third, getting an RBI double from Dakota Redfern, a two RBI double from Will Vereyken and RBI base hit from John Pantlick. 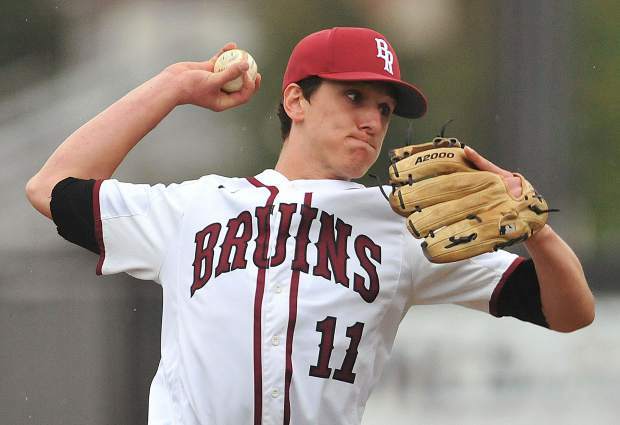 The Bruins answered with a run in the fifth inning and another in the sixth, but that was as close as they got. Leading Bear River was Nathan Van Patten with two hits and an RBI. Jake Rogers, Justin Kilgore, Cole Winters, Scottie Sandstedt, Corippo, Anthony Crawford and Josh Howser all added hits as well. In all, Bear River tallied 10 hits, but stranded 10 runners on the base paths. With the win, Colfax (12-2, 5-0 Pioneer Valley League ) improves to 2-0 against Bear River (7-8, 3-3 PVL) this season. The two league rivals are set to link up Thursday in the finale of their season series. 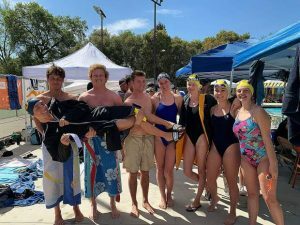 The Miners fell behind early and never recovered, losing on the road to Sierra Foothill League foe Rocklin. The Thunder grabbed the lead early with five runs in the first two innings. The Miners would answer with two of their own in the third inning, but got no closer. Leading the Miners was Luke Cornish with two hits and a run scored. James Nolen added a hit and scored a run. Cole Mason and Matthew Tintle accounted for NU’s other two hits in the game. The Miners (4-8, 0-4 SFL) will host Rocklin Thursday. The Bruins made quick work of the Cougars Tuesday night, knocking off their Sierra Valley Conference foe in straight sets, 25-14, 25-10, 25-19. Leading the charge for Bear River was freshman Jace Rath, who had a team-high 12 kills. Noah Skowronski added nine kills, Sam Nichols had four and Brekyn Vasquez had three. Running the Bruins offense with precision was freshmen setter Weston Prosser with 30 assists and four kills. The Bruins are now 7-3 overall and 4-3 in SVC play. Bear River has the rest of the week off and gets back into league play next Tuesday at El Dorado. 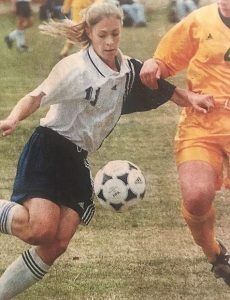 The Lady Miners are still in search of their first league win after falling at home to Oak Ridge Monday. After giving up two runs to the Trojans in the first inning, Nevada Union stormed back with four runs in the second inning. NU’s lead wouldn’t last long as Oak Ridge responded with four runs of their own in the third inning, two more in the fourth inning, and another eight in the fifth inning. Bright spots for the Lady Miners came from Vanessa Enriquez with a hit and an RBI, Lexi Blackston with a base knock and an RBI, Aja Ellsworth with two singles and Emma Karsikas with a hit and an RBI. Next up for the Lady Miners (3-11, 0-3 SFL) is a road game against Folsom Wednesday.